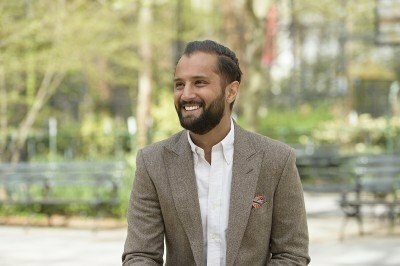 Jamil, a triathlete and Manhattan resident who also loves to surf, was used to being in top form. When an unexpected pain ballooned — literally — in his abdomen, doctors discovered the cause was an aggressive form of testicular cancer that had wrapped itself around organs and arteries. Thanks to Joel Sheinfeld, Deputy Chief of MSK’s Urology Service, and the complicated operation he performed to remove the massive tumor, Jamil is back in action. Jamil Nathoo is the seeming picture of health. The 37-year-old has been running, surfing, indoor cycling, and otherwise honing his athletic prowess for many years. So when he noticed some strange symptoms surface while he was training for a triathlon — his first, in 2013 — it didn’t take long for him to realize something was up. It started with a severe pain in his back. He’d received a clean bill of health at a routine physical only a month before, so he attributed his discomfort to his training and resumed his normal workouts. So he again visited his primary care doctor, who ordered further tests that revealed the source of the swelling: an aggressive form of testicular cancer that had spread extensively throughout his abdomen. Within a week of his diagnosis, Jamil began his first round of chemotherapy at an oncology practice in Manhattan. “In my head, the sooner I started chemo, the sooner this ordeal would be over,” he says. But after a close friend — an orthopedic surgeon who worked with a former fellow of Memorial Sloan Kettering urologic surgeon Joel Sheinfeld, Deputy Chief of MSK’s Urology Service — heard about the aggressiveness of the cancer, he insisted Jamil turn to Memorial Sloan Kettering for treatment. Though doctors at MSK knew that Jamil’s testicular cancer had spread, it wasn’t until he underwent testing before having surgery in July 2013 to remove the tumors that anyone — doctors or patient — realized the extent of the disease. The tumor was massive and intricate, involving the arteries attached to both kidneys, encasing the main blood vessels in the lower half of his body, and reaching all the way down into his pelvis. “It was a dangerous, technically demanding surgery,” says Dr. Sheinfeld, who is one of only two surgeons in the country who frequently perform this type of operation. Excising the tumor took more than 12 hours. Though the initial surgery went well and most of the tumor was removed, Jamil needed to undergo a second operation in January 2014 to clear out the remainder of the disease from areas surrounding his liver and pancreas. Surgical oncologist Peter Allen conducted the second procedure. Since the cancer affected so much of his body — and many of his organs, including his spleen and gallbladder, which were removed — Jamil’s recovery was challenging. While in the hospital for 17 days, he lost 20 pounds and dealt with excess fluid buildup in his abdomen that eventually subsided. Throughout the recovery process, he found his mental energies tested as much as his physical ones. “A nurse tried to get me out of bed the second day, and I thought she was crazy, that there was no way that I could walk. But she had orders to get me moving, and she of course knew what was best for me,” he says. “With his health and his young age, although it was very difficult for him to go through it, he actually did just fine,” says Dr. Allen. Once he returned home, Jamil continued to regain strength, eventually returning to a busy work schedule at French banking company BNP Paribas — and a packed social calendar. He’s since taken a job at Goldman Sachs and hosted several fundraisers to benefit research at MSK, including an event at the indoor-cycling chain SoulCycle that raised $40,000. The money went directly to Dr. Allen’s research into pre-invasive lesions of the pancreas, which aims to help prevent the development of pancreatic cancer. Though he’s not completely back to his pre-cancer self, he has been able to return to his physical activities. In September 2014, nine months after his first surgery, Jamil completed the Nautica Malibu Triathlon in two hours and 25 minutes — five minutes faster than he’d hoped to finish. He was inspired to participate in the race after hearing Sanjay Gupta, chief medical correspondent for CNN, discuss a group called Fit Nation on TV. Dr. Gupta put out the call to people across the country who were interested in being one of the six viewers selected to join the Fit Nation triathlon team, sharing their stories of training for the race in articles and videos on CNN.com.